Crystal clear acrylic ceiling drape tube with position clips. Each tube measures 6 feet long. 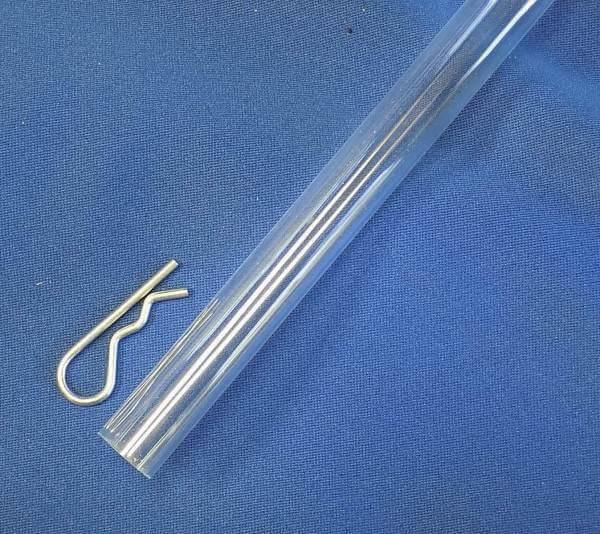 A useful way to hang ceiling drapes & swags in a variety of ways: for starburst style ceiling draping (where one end of the drape is placed on a ring/hoop and the other end of the ceiling drape is suspended further out in the room), use this acrylic tube though the rod pocket. For linear ceiling draping (ceiling swags that cascade in a "wave-like" style), hang a tube to allow the swag to rest on top of it before going back up toward the ceiling. Each tube includes 2 position cotter pins to keep fabric secure on each end. Quantity 1 = (1) 6 foot long acrylic tube and (2) positioning pins. Drapes / fabric and hanging hardware sold separately. Tube Weight (Approximate, Each): 5 oz. Positioning Pin Weight (Approximate, Each): 0.01 oz.